Across the globe, infrastructure is one of the greatest challenges of the 21st century. This has been fuelled in particular by explosive population growth and, as more economies have developed, this expanding population has also become more affluent. In the last 50 years, the population of the planet has more than doubled, from 3.3 billion in 1965 to 7.3 billion in 2015. In The Bahamas, our population has grown from 130,000 in the mid 1960s to more than 350,000 today. We also welcomed 5 million cruise visitors and 1.3 million stopover visitors in 2014. This growth has placed a massive burden on our infrastructure systems. Physical infrastructure includes airports, ports, roads, bridges, transportation and supports critical services including energy communications, water, sewage and waste. Social infrastructure includes healthcare, education, mental health, judicial systems, and other social services. Not only is infrastructure essential to support the services that taxpayers expect for the taxes they pay, but it is also critical to economies and their development and prosperity. Infrastructure is a story of evolution. It drives social and economic development. It enables us to renew our public services and physical surroundings. It allows societies, economies, companies and individuals the opportunity to live to their full potential. For island economies such as The Bahamas, while many of the challenges are the same as for larger jurisdictions, there are also a number of challenges that are unique. For one, infrastructure planning is not for a three- or five-year window, but for decades. This is more difficult in a small growing economy with very limited industry diversity. Not only are island economies more susceptible to economic shocks, but also the path of development is often volatile, with other major projects happening sporadically and placing uneven strain on the island’s infrastructure services. Another challenge is funding. These projects, which can cost in the hundreds of millions or billions, are very complex to finance. There are many projects across the region and the world competing for financing which is cost efficient and matches the long-term nature of the projects. In the islands, this financing can be harder to come by, with many international equity and debt investors seeing projects in the islands as too small or too risky for their investment appetites. Location and remote settlements are also a major challenge. Islands are by their very nature more difficult to access, and in the case of The Bahamas, we have 700 islands and cays of which more than 20 receive government services and transportation infrastructure becomes all the more critical. Also, “universal service” is a major financial and logistical challenge for this country, as while it is generally not economically viable to service more remote settlements, it is nevertheless an obligation that defaults to government. The trade-off between attracting foreign investment and expertise, and a desire for local participation, employment and control is another continuing challenge for island jurisdictions. In most small economies there is simply not the financial capacity or state-of-the- art “know-how” to finance and execute a major infrastructure project. This introduces the need to bring in financial capacity and expertise, which often becomes a political football in many jurisdictions. Indeed, the transfer of infrastructure assets to the private sector inevitably requires the ceding of some level of control. Depending on the structure, the level of control can vary considerably as “ownership” can vary considerably. But regardless of who actually owns the infrastructure, the fact remains that government will always retain the primary public service obligation and therefore, often by way of regulation, will always maintain some level of control. And rightfully so; it is, after all, government that will be expected to respond when services are not delivered or when prices skyrocket; it is government that will need to step in if agreements fail; and it is government that will be blamed for poor services. The challenge, however, is in understanding what level of control needs to be retained in order to achieve public expectations, while still providing enough flexibility to private sector owners to manage an efficient operation. For investors, operators, advisors and other stakeholders, there are many infrastructure opportunities across the Atlantic/Caribbean region. In 2013, it was estimated by KPMG that there was almost $20 billion in the regional infrastructure pipeline, and with Cuba coming on stream, this number will be significantly higher today. At least $2 billion of this resides in The Bahamas. This includes investment needs in the energy sector, waste, healthcare, ports and airports across the country, education facilities, justice facilities and the list goes on. That said, The Bahamas has been and continues to be a regional leader in infrastructural development, with a number of major projects delivered under public/private partnership (PPP) models. Notable examples of these include the Lynden Pindling International Airport (LPIA), the Nassau Container Port and Gladstone Freight Terminal, and ongoing communications and energy sector reform. The development of Freeport is also an example of a PPP that resulted in a relatively new city of 50 thousand people. LPIA is the main international gateway to The Bahamas and the fourth busiest airport in the Caribbean region. In 2014, LPIA served 3.3 million passengers and is built to accommodate 5 million. The Nassau Airport Development Company (NAD), a Bahamian company owned by the government and operated by Vantage Airport Group, manages and operates the airport under a 30-year lease. NAD is responsible for the majority of LPIA’s infrastructure including parking lots, terminals, runways and taxiways and all revenue generating and commercial development projects. As a private company, NAD receives no government guarantees or grants and is now a completely self- sustaining commercial entity based on international best practices. In 2009, a $409.5 million redevelopment project broke ground under the management of NAD in a phased project for the 600,000 sq ft complex, and this was completed on budget and on schedule. This state-of-the-art facility is now one of the most efficient and attractive airport complexes in the region. The Nassau Container Port is also a success story, which, like LPIA, is financially and operationally self- sufficient with no recourse to government. Several years ago, the government decided to relocate container, bulk and break-bulk shippers that operated along the waterfront in the downtown capital of Nassau to a less congested site. A coalition of shipping interests formed Arawak Port Development Ltd (APD) and in May 2010, APD partnered with the government for the creation of a new port under a 45-year land lease and concession agreement, with the government owning 40 per cent of the project. Arawak Port, a $100 million International Ship and Port Facility Security (ISPS) compliant facility comprising Nassau Container Port (on Arawak Cay) and Gladstone Freight Terminal (inland terminal), achieved substantial completion in May 2012. 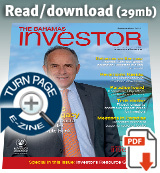 This followed closure of APD’s IPO in January 2011, which was the most oversubscribed public offering with the greatest number of individual subscribers in the history of The Bahamas. APD’s preference share offering in 2013 was also heavily oversubscribed, even at an interest rate margin that was comparable to sovereign domestic offerings. For two consecutive years, Florida Shipowners Group has rated Nassau Container Port as the Caribbean region’s most productive port, beating 24 regional rivals. APD has over 100 employees and processes more than 60,000 TEUs of cargo annually. In the case of the energy sector, electricity supply across The Bahamas to date has been provided by the Bahamas Electricity Company (BEC) except in Grand Bahama and a few other isolated locations. Over the years BEC had become inefficient, heavily burdened with financial debts, and the cost of electricity to the consumer is one of the highest in the region. BEC was also completely reliant on fossil fuel generation with no renewable energy production in the energy mix. In late 2013, the government issued a request for proposal for the restructuring of the energy sector. Its objectives are to dramatically reduce the cost of energy to the consumer while developing a reliable, cost effective, secure and environmentally responsible energy sector. As part of the overall restructuring of the sector, the government is in the process of establishing a new electricity utility for The Bahamas, which will continue to be owned 100 per cent by the Bahamas government, but will be privately managed by an experienced energy services company. New electricity sector legislation is to be passed. The government is also proposing to refinance all of BEC’s current debt, restructuring costs, and startup capital for the new entity, through a long-term revenue bond to be placed in the local and international capital markets. In conclusion, our lives and livelihoods are heavily reliant on good quality infrastructure and services. Infrastructure is not just about building new assets to be able to provide services to a country’s population, it is about the high quality delivery of those services. The more a population and an economy grows, the more pressure is placed on the infrastructure supporting it, so continuing evolution and improvement is required. 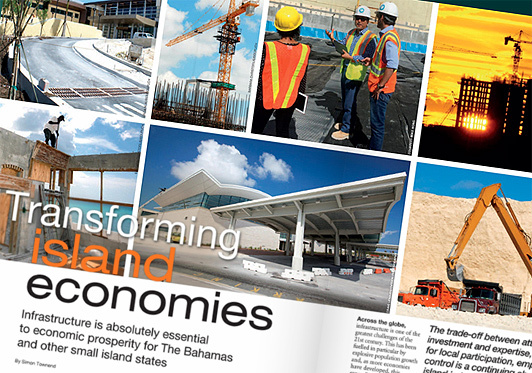 For The Bahamas, as a developing island economy, this infrastructure across our archipelago is absolutely essential to our economic prosperity. The Bahamas has achieved much, with some very successful PPP projects to date, but there is a lot of work still to be done and many challenges yet to overcome.